Last weekend, we went on a 4-hour landtrip-barge via the Southern tip of Cebu, Santander for a diving trip to Dumaguete. I was excited to use my newly purchased Aladin Prime dive computer. Unlike the dive spots I've been to, Dauin is primarily composed of brown sandy bottom. One has to have the spotter's eye to see those small creatures and critters found at the bottom. Masaplod on the other hand, is a small fish sanctuary, where corals grew in the middle of this sandy bottom. There we found this 1 meter-sea turtle, that didn't mind our presence. Coconut Groove in Apo Island was the experience to beat. The waves on the surface was fierce, thus, we have to descend fast. Luckily, the decongestant worked well this time, I made it down fast. At the bottom, the current was even stronger swishing here and there, thus, we have to hold on to our dear life line (a rope). We almost aborted the dive when there was nothing to hold on to. Thanks to the school of huge mating jacks that appeared below us, we were enticed to descend again. Thanks too to our Dive Masters, who made us feel safe amidst the strong current. 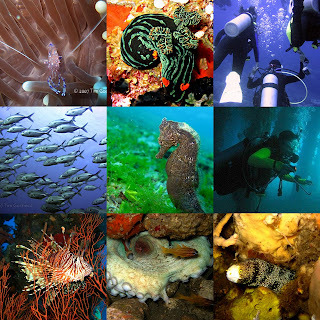 The reefs of Apo Island is a vast area filled with corals and schools of fish. With slightly strong currents and ships docking on the surface, we need our dive light in Ducomi Pier. The pillars of this pier are filled with corals and different interesting creatures. You can actually hear the fishes flap their fins! 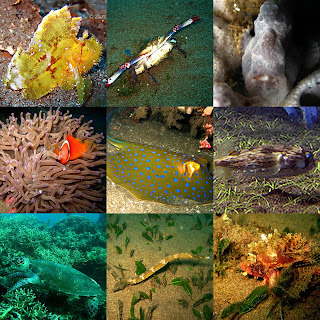 Lionfishes dominate the area as well. I skipped the morning dive in Ducomi as I opted to take a good rest and lounge around the resort with a hearty buffet breakfast. 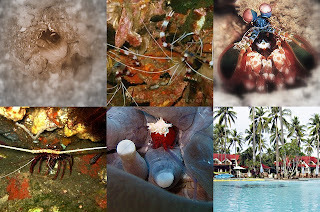 Can't wait to dive in Philippine's prime dive spot -Tubbataha, Palawan next year. you seem to be enjoying your dives, ah. I don't really know if i can go deeper than 10 ft. I think I need a submarine to that. hehe. haha dive dyan, samal island should be good.